Co-edited with Fred Gingrich. Treating Trauma in Christian Counseling and Psychotherapy. IVP, 2017. 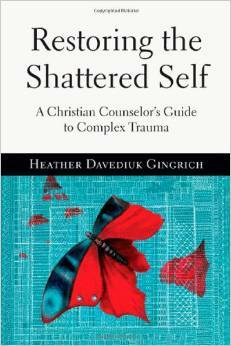 Restoring the Shattered Self: A Christian Counselor's Guide to Complex Trauma. IVP Academic, 2013. 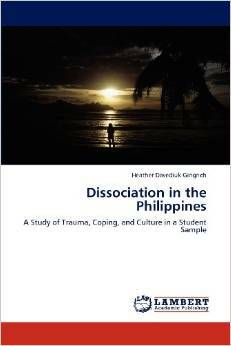 Dissociation in the Philippines: A Study of Trauma, Coping, and Culture in a Student Sample. Lap Lambert, 2012. Gingrich, H. D. (2013). Restoring the shattered self: A Christian Counselor’s Guide to Complex Trauma. Downers Grove, IL; InterVarsity Press. Gingrich, H. D. (2012). Dissociation in the Philippines: A Study of Trauma, Coping, and Culture in a Student Sample. Saarbrücken: Germany: Lambert Academic Publishing. Gingrich, H. D. (2014). A Christian therapist’s perspective.Section of chapter Overcoming spiritual abuse, in Miller, A. Becoming yourself: Overcoming mind control and ritual abuse, pp. 339-341. London, England: Karnac Books. Gingrich, H. D. (In press). Treating adult survivors of child sexual abuse in Christian counseling and psychotherapy. In J. Aten & D. Walker (Eds. ), Treating trauma in Christian counseling and psychotherapy. Downers Grove, IL: InterVarsity Press. Gingrich, H. D. (2011). Complex traumatic stress disorder and dissociative identity disorder. In T. Clinton & R. Hawkins (Eds. ), Popular Encyclopedia of Christian Counseling (pp. 221-223).Irvine, CA: Harvest House. Gingrich, F. C. & Gingrich, H. D. (2011). Mood disorders. In T. Clinton & R. Hawkins (Eds. ), Popular Encyclopedia of Christian Counseling (pp. 205-208). Irvine, CA: Harvest House. Gingrich, H. D. (2005). Trauma and dissociation in the Philippines. In G. F. Rhoades, Jr. and V. Sar (Eds.). Trauma and dissociation in a cross-cultural perspective: Not just a North American phenomenon. New York, NY: Haworth Press. Gingrich, H. D. (2013). Dissociation and Filipino adolescents: Symptom continuity and cultural reflections. Manuscript submitted for publication. Cook, M., and Gingrich, H. D. (2013). Graduate counseling students’ use of Facebook privacy settings: Implications for self-disclosure. Manuscript submitted for publication. Hogstrom, K. E., &Gingrich, H. D. (2013).Experiences and utilization of member care in an international missionary sample. Manuscript submitted for publication. Rathbun, T. & Gingrich, H. D. (2013). War Trauma: A qualitative study of seven Ugandan women using the Harvard Trauma Questionnaire. Manuscript submitted for publication. Gingrich, H. D., & Gingrich, F. (2011). Integration and attachment theory: A response to Greggo. Edification, 5(1), 16-19. Gingrich, H. D.(2011). Traumatic stress and international Christian workers: Assessment and intervention, Christian Counseling Today, 18(3). Gingrich, H. D. (2011). Redemption in the lives of hurting people. Denver Seminary Magazine. 7(3), 11-12. Killam, R. & Gingrich, H. D. (2011) Sexuality among evangelical college women. Growth: The Journal of the Association for Christians in Student Development, 10, 40-53. Gingrich, H. D. & Ohlson, J. (2010). The heart of the matter (2010). Journal of Psychology and Christianity, 29, 82-87. Haskell, H. & Gingrich H. D. (2007, but released in 2010). Expanding our horizons to include dreams as a spiritual resource (2007, but released in 2010). Phronesis (Journal of Asian Theological Seminary) 14,41-65. Gingrich, H. D. (2009). Assessing dissociative symptoms and dissociative disorders in college students in the Philippines. Journal of Aggression, Maltreatment, & Trauma, 18, 403-418. Gingrich, H. D. (2009). Complex traumatic stress disorders in adults (2009). Journal of Psychology and Christianity, 28, p. 269-274. Gingrich, H. D. (June 30, 2009). Lost Voices – interview for film on dissociation. Director: Cassia Hendrickson. Gingrich, H. D. (July/August, 2008). Lost in the forest: Reflections on nawawala sa sarili (July/August, 2008). RMTDS (Rocky Mountain Trauma and Dissociation Society) News, 2-5. Gingrich, H. D. (2007). Filipino Christianity. Denver Seminary Magazine. 3(4), 12. Gingrich, H. D. (2006). Dissociative symptoms and indigenous Filipino concepts. Social Science Diliman. 3(1,2):1-48. Gingrich, H. D. (2006). Philippine Society for the Study of Trauma and Dissociation. International Society for the Study of Dissociation News, 24(5). Gingrich, H. D. & Gingrich F. (2005). Co-guest Editor of issue. Phronesis. (Asian Theological Seminary/Alliance Graduate School, Philippines) 12 (1). Gingrich, H. D. (2005). Not all voices are demonic. Phronesis. 12, 81-104. Gingrich, H. D. (2005). Trauma and dissociation in the Philippines. Journal of Trauma Practice,4(3, 4).Published simultaneously in G. F. Rhoades, Jr. and V. Sar (2005), Trauma and dissociation in a cross-cultural perspective: Not just a North American phenomenon. New York, NY: Haworth Press. Gingrich, H. D. (2004). Dissociative symptoms in Filipino college students. Philippine Journal of Psychology, 37, 50-78. Gingrich, H. D. (2004). International Column. Reflections on dissociation in the Philippines. International Society for the Study of Dissociation News, 22(5). Gingrich, H. D. (2002). Stalked by death: Cross-cultural trauma work with a tribal missionary. Journal of Psychology and Christianity, 21(3), 262-265. Gingrich H. D. & Gingrich, F. (1999). Dual counselor marriages (1999). Christian Counseling Today, 7(3), 14-15. Davediuk, H. (1983) Psychology: Friend or foe (1983). The Clarion, Redeemer Christian High School, Ottawa, ON, Canada. Holeman, V. T. (2012). Theology for better counseling: Trinitarian reflections for healing and formation. Downers Grove, IL: InterVarsity Press. Harling, B. (2011). Freedom from performing. Colorado Springs, CO: Navpress. Cameron, D. & Cameron, S. (2009). The rest of health: Learn the 7 vital strategies to optimize your well-being. Sisters, Oregon: VMI Publishers. Harling, B. (2008). Rewriting your emotional script: Erase old messages, embrace new attitudes. Colorado Springs, CO: Navpress.